It has been a long week of work in La Rioja, but at the same time we had the opportunity to continue expanding our wine knowledge and visiting some of the best wineries in the world (if not the best). Inside, centuries of knowledge about the dark liquid, and very interesting explanations and stories about land, grapes, people, culture and tradition. 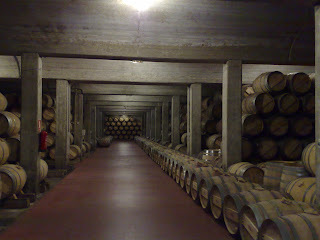 Bodegas RODA. 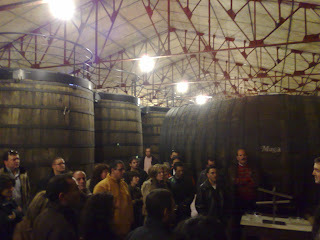 Visiting of primary fermentation space. 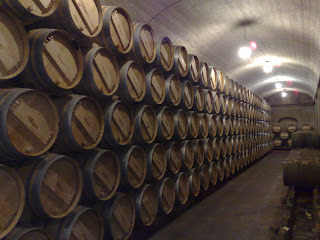 Once the yeast has done its job in converting the grape juice into ethanol, wine is transferred into oak barrels. 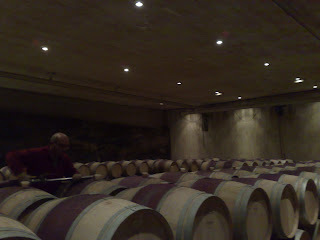 Here a man preparing the tasting of some of the wines in the middle of the ageing process. 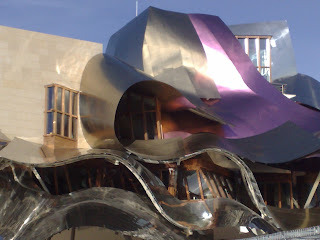 After asting some of the best RODA's wines, we haeded towards Bodegas Marques de Riscal. Here the 5star hotel that they built some years ago in front of the winery. Designed by Frank Gehry. 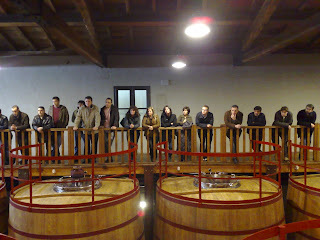 Our visit to the second winery of the day offred a different perspective compared to what we saw in the other wineries, and it was curious to see the contrast between the small and traditional wineries as compared to the marketing anb business orientation of Marques de Riscal. A girl that talked like a robot and looked as if she was repeating the same words 100 times a day accomapined us in a rapid tour around the hotel, followed by the visit to the winery (which, to be fair, was quite interesting too) and of course the final wine tasting. 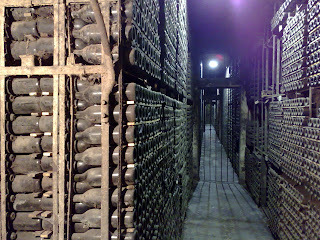 Since hundreds of years ago, in the room below they store some of the best bottles produced every year. It is a very humid place, with no light and zero movement or noise of any kind (except the visits like ours ?). A room like this one is the real proof that wine has no expiring date (you can die from drinking water, not wine....well, depending on the quantity). These bottles are only opened in very special ocasions or purchased in auctions, and they have to be opened with an incandescent iron to cut the fragile old glass and treated with the softest movements. In the winery they say that Frank Gehry was convinced to design the hotel building in this room. They opened a bottle from the year the architect was borned, and as soon as he tried it the magic of wine made its presence in the mouth of the architect convincing him to design the hotel. Maybe they added at the same time one or two zeros to the contract figures, but the convincing factor, of course, was the wine. 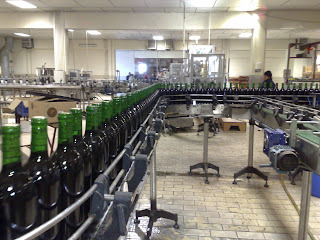 Final Bottling and labelling process. The last winery of the day, and the best one in my opinion was Muga. 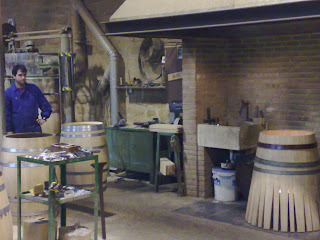 The explanations of the grandson of one of the founders about the winemaking process were really interesting. In the pic below, the group listening carefully to the "fining" process. In Muga and in most wineries, this process is done by adding about 300 egg whites to each of these huge vessels, and albumin does the rest. The fact that is the electric charge of the albumin protein that produces the desired effect of removing unwanted particles in the fining process has been discovered not so far ago. There was a Spanish saying for describing the taste of good wine: "sabe a francés" (tastes French). Well, as you may know, your blood contain also lots of albumin to transport oxygen. The story tells that during the war against the French in the beggining of 19th century, some people from the region decided that the recipients and the fermentation environment of wine were a good place to hide some dead french bodies. 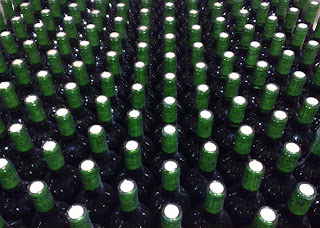 It happened that wine comming from those turned out to be really good, and here you had the saying "it tastes french". True? First it was discovered that meat had a good fining effect on wine, and then that it was in fact the blood of that meat which produced the effect. Now we rely more on Albumin....not such a mess as blood! Although using different kinds of blood is still legal and used. Muga is the only winery where they produce their own barrels from the wood of the best French oak woods.